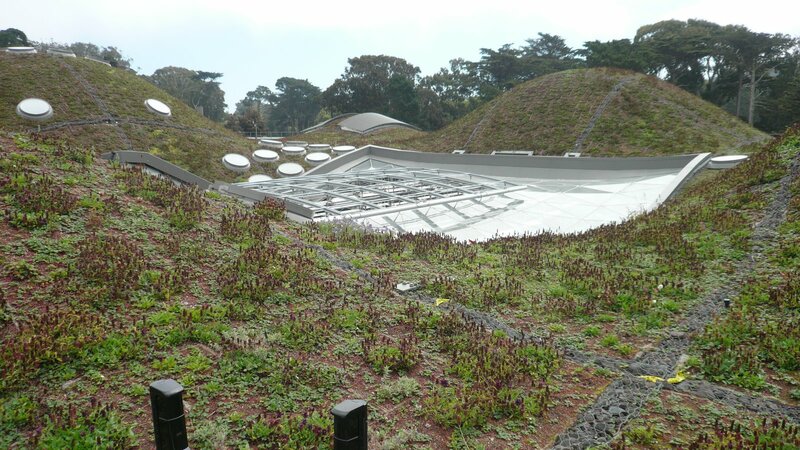 California Academy of Sciences – We can’t wait! 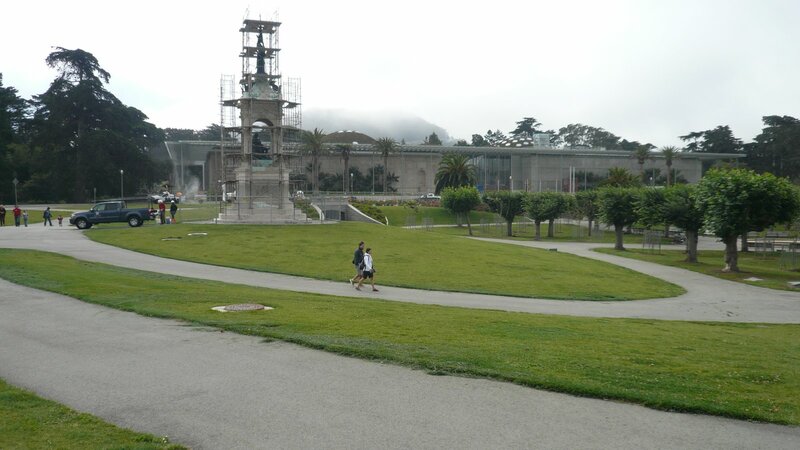 While some of the TechTalk staff had the opportunity to be at the Moscone Center during the Intel Developer Forum, the real treat of the trip was in Golden Gate Park. The California Academy of Sciences new building is almost ready for it Grand Opening on September 27, 2008. Thanks to Helen Taylor, the TechTalk staff had the opportunity to see much of the new facility. The general consensus from those in attendance…WOW! The most noticeable and, at the same time, concealing feature of the building is the live roof. The vegetation and placement help it blend into the surrounding park. The skylights are concave to maximize the natural light. The rock separating the sections gather rainwater run off from the panels and is reused throughout the building. There are also motion sensors and cameras to monitor the development of the roof and also as a security measure. The four-story living rain forest recreates the conditions in Borneo, Madagascar, Costa Rica and also supports an Amazonian flooded forest that actually floods…inside the building. Visitors traverse a spherical staircase through the exhibit that moves through informational areas on each habitat into an open view of native plants and animals. This includes dozens of birds that will live throughout the exhibit. 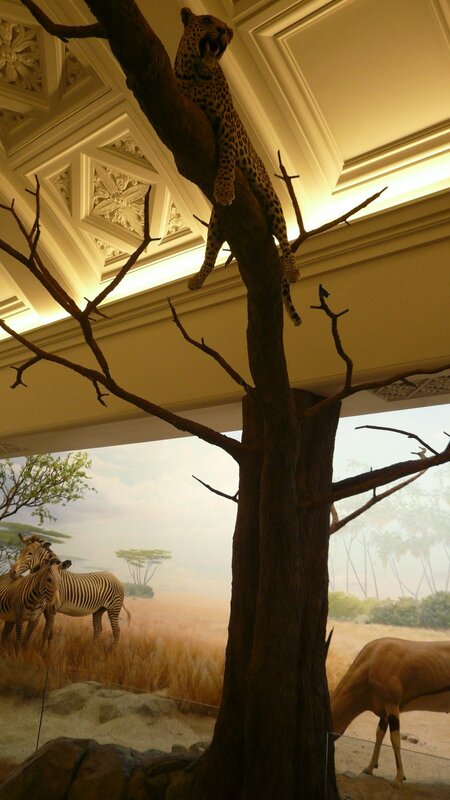 Dioramas in the African Hall were recreated to showcase the different habitats and ecosystems around the coast of the African continent. This hall is the only hall to be recreated in its original form from the previous building. Even casts of the ceiling tiles and crown molding were used to keep it as close to the original as possible. Visitors can stroll along the Savannah, past mountain gorillas around the Cape of Good Hope where penguins native to South Africa and Nambia greet guests and send them back up the opposite side of the continent. Throughout the building, technology combines with science and story telling to provide visitors with installations that appeal to all senses. Touch screens, interactive displays and monitors throughout the building are all controlled from a central location. This enables the information for exhibits to be updated as needed and changed throughout the building. 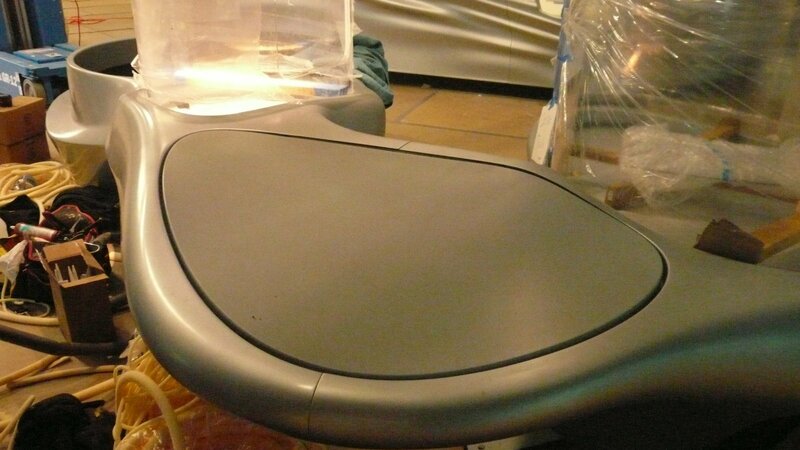 Below is the base for an interactive touch display. 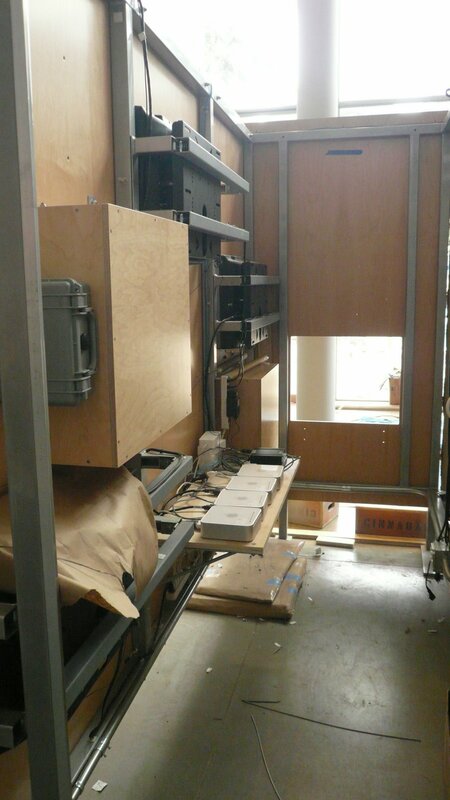 It was not quite ready when we were there, but all the equipment was in place. An overhead projector displays images while reading motion interaction. 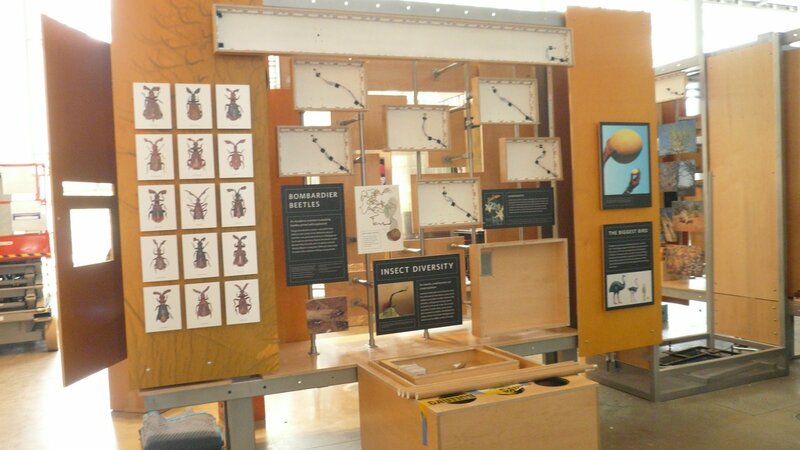 This allows visitors to interact, move and change the images displayed. We have not even talked about the glass ceiling tunnel in the Steinhart Aquarium, the Morrison Planetarium, the lecture hall that plays 3D movies…and there is a good chance I am still leaving something out. Thanks again to Helen Taylor for taking the time to give us a tour and all of the great information she provided. After 12 months of operation, the facility is currently on track to receive LEED Platinum certification. An outstanding achievement for all involved. CAS Home – the organization’s website. Pictures and videos of construction, exhibits and information for visitors. Limor Schafman of Keystone Technologies joins Tom to discuss IPv6. She will cover the basics of what it is, where it is in implementation and the costs associated with the changes. The itSMF USA Fusion 08 conference and exposition brings together the best minds in the service management industry. During the event, industry experts will present key insights on ITSM best practices, innovative new strategies, and real world results. Covers both the business of video on the net and the technology of streaming, downloading, IPTV and mobile video delivery. Covering both b2b and b2c business and technology issues in the enterprise, advertising, media and entertainment, broadcast and education markets. Kudos to www.somewhatfrank.com for the great list of the year’s tech conferences. Julie Barko Germany serves as the director of the Institute for Politics, Democracy & the Internet and director of marketing and communications for The George Washington University’s Graduate School of Political Management. She will be on the show this Sunday discussing the Web Tactics of Presidential Candidates with Tom. No matter which side of the aisle you are on, tune it to learn more about how both parties are using the web to get their message in front of you. IDF is where Intel and the ecosystem come together to share their latest innovations and vision for the future of technology. Come hear industry news, learn about trends, and discover opportunities to integrate what is discussed into your projects. Our good friend and frequent guest, Hal Berghel covered Defcon 16, the hacker convention, in Las Vegas. As it ended, Hal joined Tom to cover the weeks events. Listen to the show from here using the Yahoo!Media Player. This week’s guest is Sheldon Gilbert, CEO and Founder of Proclivity Systems. Proclivity uses company’s data to decrease the number of solicitations sent to a customer by increasing the relevance of the emails the company sends. Check back after the show for links to the stories in our week in review. Tune in at our regularly scheduled time on 1100 KFNX AM in Phoenix and simulcast on their website. Link to the station on the left. Just click the KFNX logo. For updates and details on the festivities, sign up for e-News on the website at www.calacademy.com or call 415.379.8000. Even if you cannot make it out for the grand opening, the website has a wealth of information about the organization, other upcoming events and includes pictures and videos about the sustainable design, construction of the facility which includes a living roof and other green design techniques. TechTalk, hosted by Tom D’Auria, is broadcast on 1100 KFNX AM in the Phoenix area every Sunday afternoon and simulcast on the station’s website across the web. Our shows are archived on the show’s website and can be downloaded from the iTunes Online Store (search “imi techtalk” to find on iTunes). TechTalk’s goal is to educate our listeners about technology and how it can positively affect their lives and businesses. Our listeners are from all over the globe and include home, small business, and enterprise users.